The 19th century was an era of chaos. In the world of patriarchal dominion, it was hard for the women to shine and to some extent, to be born. From educational rights to political rights, women were blessed with none, let alone them making a successful career. But every century has a few exceptions, and Mrs. Anandibai Gopalrao Joshi was one of them. From pursuing her career to becoming the first female Indian physician, the miraculous story of Anandibai Joshi is something modern women cannot think of. Let’s make her story heard. Anandibai was born as Yamuna in Thane, the district of present-day Maharashtra. 31st March 1865 was the day when she took birth in an orthodox Hindu Brahmin family. Anandibai’s condition was no better than any other women in the society at that time. She was soon married to Gopalrao Joshi, who was twenty years older than her. But family pressure demanded her to be married just at the age of nine. After her marriage, she was renamed as Anandi. A girl of nine married to a man of 29, how good her life can be? But her marriage turned to be a blessing for her. Anadibai’s husband, Gopalrao was a man of progressive thinking. And after observing Anandi’s interest, he started teaching her English, which was a rare sight at those times. Even one day, when Anandi was helping her mother-in-law in the kitchen, Gopalrao even beat her for missing her classes. Soon, she became a well-read intellectual girl in the family. But neither of these things happened smoothly. The couple faced many obstacles, many resistances from their parents. But nothing stopped them. In the midst of everything, Anandi gave birth to her son at the age of fourteen. Although Anandi gave birth to a boy, he only lived for ten days because of unavailability of medical assistance. This event shook Anandi and Gopalrao. Proving a turning point in her life, Anandi decided to study medicine. Her husband Gopalrao sent a letter to Royal Wilder, an American missionary, in the year of 1880. They agreed to let her study on the condition of turning her into a Christian. But the Joshi couple declined the proposal. However, soon the published correspondence of this news attracted the attention of Theodicia Carpenter, a resident of New Jersey. Anandi’s determination and Gopalrao’s support impressed her. She wrote a letter to the couple immediately, conveying her intention to give her accommodation in America. Despite having several health problems, Anandi and Gopalrao finally decided to take the medical course of the Women’s Medical College of Pennsylvania. But soon, they received the protests of the Hindu conservative society. But the Joshi couple was determined, and Anandi addressed the Hindu community in the Serampore Hall. She gave an inspiring speech on how India needs Hindu female doctors and her goal of opening a medical college for women in India. Her speech became famous, and the couple received a huge amount of financial contributions to her cause. 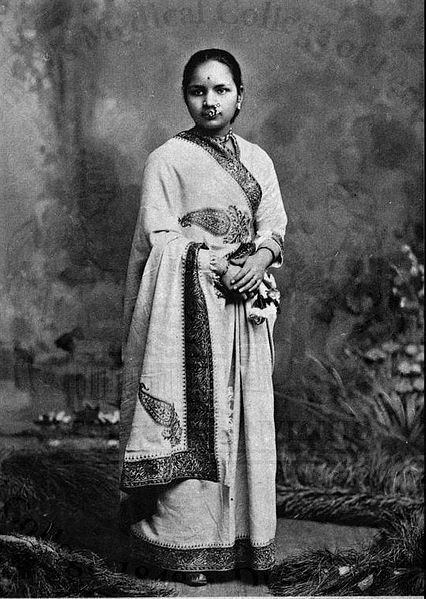 Mrs. Anandibai Joshi travelled to New York from Calcutta by ship and started her medical journey at the age of 19. But her health problems were never solved. Even her health started deteriorating due to the cold weather and unfamiliar diet. Soon, she was diagnosed with Tuberculosis. Still, she graduated with an M.D. on 11th March 1886. On her graduation, Queen Victoria sent her a congratulatory note. By the end of 1886, Dr. Anandibai Joshi returned to India and received a warm welcome. She was appointed as a physician-in-charge of the female ward of the Albert Edward Hospital. Dr. Anandibai Joshi died the next year because of her feeble health, on 26th February of 1887. Her ashes were sent to Theodicia Carpenter, and she buried them in her family cemetery. In an Indian society where women’s education was considered as an unthinkable sin, Anandibai Joshi became the first female physician in Indian history. Her untimely death did not let her career turned into a successful profession, but her bold step surely opened a new door in the history of Indian feminism.